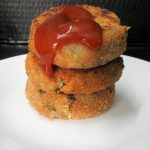 Quinoa and Soya Kheema Cutlet is a great delicious way to eat quinoa, soya chunks both of which are not enjoyed at home. Since cutlets are appreciated in my place and I make cutlets generally with leftovers. Empty’s the fridge without complaints too. What was a necessity for the hard-riding soldiers a quick meal on the horseback today has today become something that is enjoyed in so many forms, burgers, frankies, even our humble vada pav is an example of this amazing invention. To read more about cutlets check here. The main ingredients in the quinoa and soya kheema cutlets are quinoa, soya chunks, potatoes and veggies of your choice. This recipe is adapted from Nalini’s Kitchen. Peel and grate the boiled potato. Set aside. Wash and rinse in water the quinoa. Cook the quinoa as per instructions on the packet. Mine needed 1/2 cup water. Fluff it with a fork and set it aside. Meanwhile, cook the soya chunks in boiling water with a pinch of salt. Once done rinse the soya chunks in the cold water for a couple of times. Squeeze all the water and pulse it in a blender to bit fine paste. Boil the veggies like beans and peas with a little salt. I used grated carrots. In a wide bowl mix grated potato, quinoa, soya kheema, boiled veggies, grated carrots and chopped coriander leaves. Take a lemon size of the mixture and made it into the desired shape or flatten it to a disc and keep it aside. Dredge the flattened disc in the breadcrumbs. Heat a non-stick tava/skillet arrange the cutlets drizzle a little oil around each cutlet and shallow fry it both sides till golden. Remove it and drain on a paper towel. Cook the rest in the same way. I prefer to grate the potato after boiling, as it is not sticky when grated. There should not be any moisture in the soya kheema and cooked quinoa. 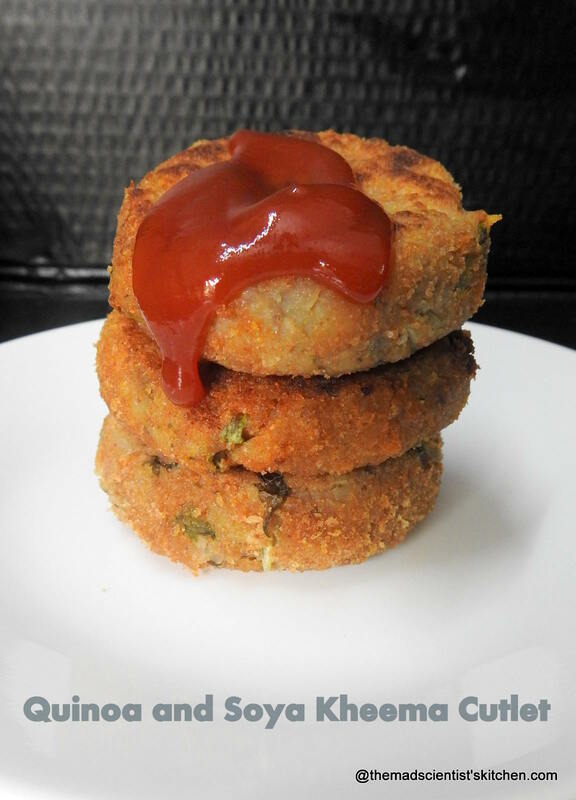 Quinoa and Soya Kheema Cutlet does not contain meat but the kids cannot tell! Two of the most healthy ingredients , full of protein , the cutlets have turned out fabulous . Nice clicks ! Cutlets have turned out soo good, looks super delicious. Wow! That is a protein powerhouse there! Love it. Protein loaded cutlets. Simply love it. Those cutlets looks so addictive and super delicious. Love that perfect golden crust!! 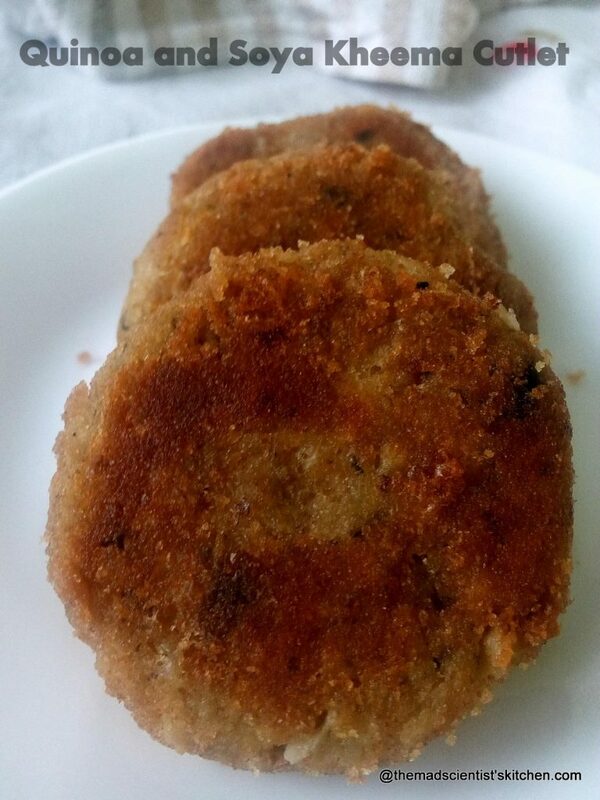 Cant ask more both my favourite ingredients together in cutlets, how delicious its looks. wow arch….these looks so good…protein packed! !